We are very aware that Alma Care (UK) only succeeds if we provide the services which people want and expect. In order to do this we must make sure that the people who are delivering the care, the care worker’s, are fully vetted, trained and supported. They can only do their job if they are working in a professional and well-regulated environment. We provide everyday care and the duration of a visits range from 15 minutes onwards. Live-in care provides flexibility when, typically a customer needs a personal assistant around the house at various times of day or night to assist or carry out varying tasks. No two days need be the same and our customers can, if they wish, choose a different agenda each day. The daily tasks of everyday living can be fulfilled by the Personal Assistant but he/she can also help with pastimes and activities whenever required. There are several different forms of dementia and it affects people in different ways. That is why it is so important that each customer receives good professional service plus respect and kindness. The care we provide for people with learning disabilities is tailored to each individual’s needs. 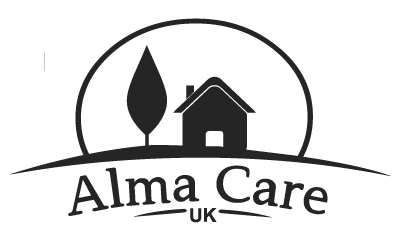 Alma Care (UK) does not believe in ‘one size fits all’. Respite care is the provision of short-term, temporary relief to those who are caring for family members. We support families and friends by looking after their loved ones so they can have a break. This could be hours, weeks or even months. End of life care can help those with a terminal illness or terminal condition that has become advanced, progressive and incurable, to be cared for at home as per their wish.